This season the Anaheim Ducks are celebrating 20 years in existence. This would have been their 20th season if not for the 2004-05 locked out year. Many events and promotions are scheduled for the season, however the main event of the year (at least for a jersey nerd like myself) was held on Sunday. 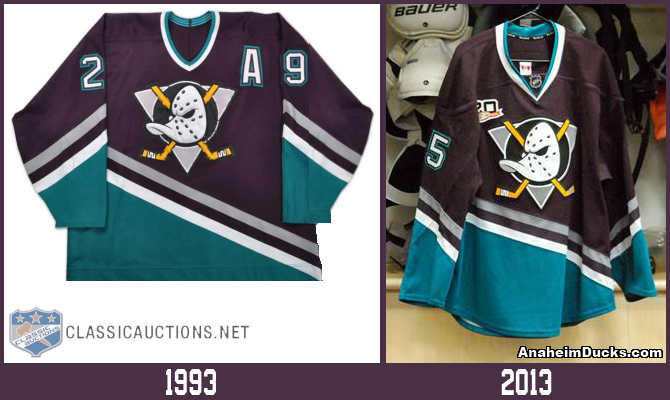 The Ducks wore replicas of the eggplant and jade sweaters the Mighty Ducks wore on opening night, October 8, 1993. I will use this opportunity to explain what goes on in the mind of a jersey nerd during one of these events. 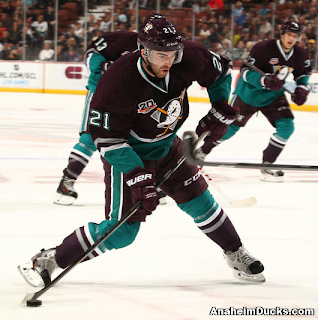 I believe that the majority of fans will look at the sweaters the Ducks wore on Sunday and think that they are the same as the 1993 sweaters. Jersey nerds will look at the same sweaters and will see all of the little changes made. Let’s explore, shall we? Starting with how the jersey is constructed. In 1993, team sweaters were made by CCM, who at the time was a separate company from Reebok. In 2013, Reebok has since purchased CCM and is in charge of manufacturing all NHL game-used sweaters under the Reebok banner. The way Reebok makes their sweaters is called the Reebok Edge style. This style includes tapered sleeves and torso, as well as a collar insert containing the NHL shield. The bottom hem of the jersey is rounded to give a sleek look. None of those features appeared on the 1993 jerseys. The most obvious difference is the 20th anniversary patch placed on the 2013 Reebok sweaters. That addition was to be expected. To a jersey nerd these differences constitute considering the sweater worn by the Ducks on Sunday, a completely new version of the 1993 sweater rather than a “copy” or “replica”. That’s why the version being sold at the Ducks’ team store ruffles my feathers. The team store is selling a copy of the 1993 sweater (complete with CCM branding), but with the addition of the 20th anniversary patch. Wait, that’s NOT the jersey I saw the Ducks wear Sunday night! If I’m going to pay over $120 for this thing I want it to look like what the players wore on the ice! I want a collar insert, tapered torso and arms, and a rounded hem. I want Reebok branding. If the Ducks were to simply remove the anniversary patch from the jerseys on sale to the public and promote them as 1993 Mighty Ducks sweaters, us jersey nerds would agree with that. However, the Ducks are selling the 1993 version as a replica of what the team wore on the ice during their 4-1 defeat of the Ottawa Senators. I know the points I discussed above do not matter to 99% of the people purchasing the sweater. I know that I am in an extreme minority and my ideas would not be taken into consideration when the jerseys were manufactured. Finally, I know that most people will hear my ideas and believe I am crazy. However, this is what matters to me and it’s what makes me proud to call myself a jersey nerd. How the replicas are presented to the consumers is another rating altogether. Exactly what I was thinking! Also congrats on starting a new blog!